With support from HCTF’s Public Conservation Assistance Fund (PCAF), the Salt Spring Island Conservancy is making a different to species-at-risk on Salt Spring Island. Salt Spring Island is home to a number of vulnerable wildlife species, including the red-listed Western Bluebird (Sialia mexicana) , Western Painted Turtles (Chrysemys picta bellii), Barn Owls (Tyto alba) and Western Screech Owls (Megascops kennicottii). With over 70% of land on the island being privately owned, the Salt Spring Island Conservancy (SSIC) focuses on working together with landowners to conserve and protect wildlife habitat on their properties. 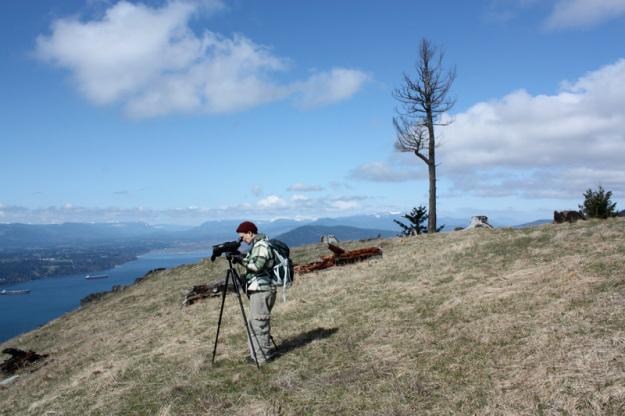 Through outreach, education and organization of on-the-ground conservation activities, SSIC is making great strides in the preservation and improvement of wildlife habitat on this jewel of the Southern Gulf Islands. PCAF grants are designed to get more people actively involved in conservation work. SSIC embodies this principle through mobilization of volunteers to enhance habitat, including building nest boxes for bluebirds and installing protective cages at turtle nesting sites. Volunteers are also encouraged to participate in monitoring programs to help guide future conservation activities. HCTF is pleased to have supported the Salt Spring Island Conservancy in their conservation efforts through the PCAF program.